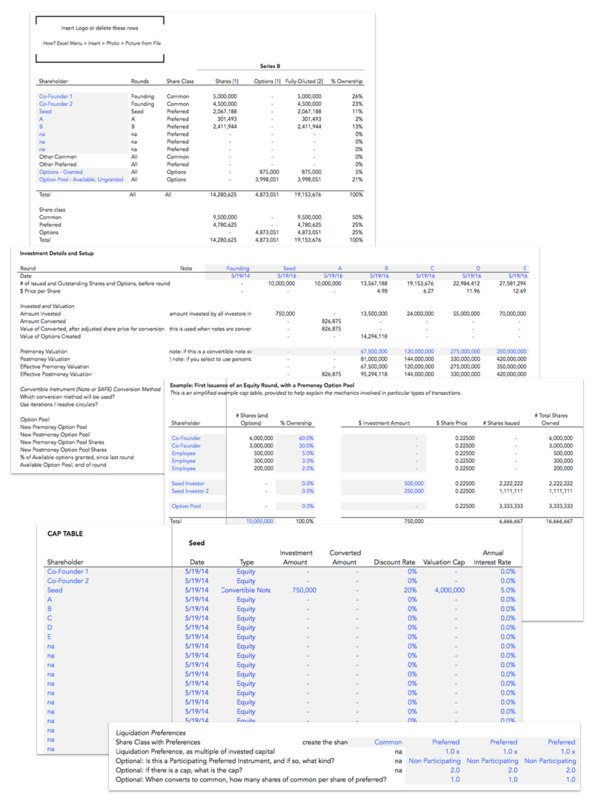 Financial model template to create a cap table through multiple rounds of investments, and forecast how investment rounds impact ownership, dilution, valuations, and distribution of proceeds to entrepreneurs and investors through a detailed exit waterfall. Used by investors, lawyers, and pre-seed, Seed, A, B, C, and post-funding stage companies. Unlocked - use in Excel or Google Sheets, edit anything - last updated in January 2019. 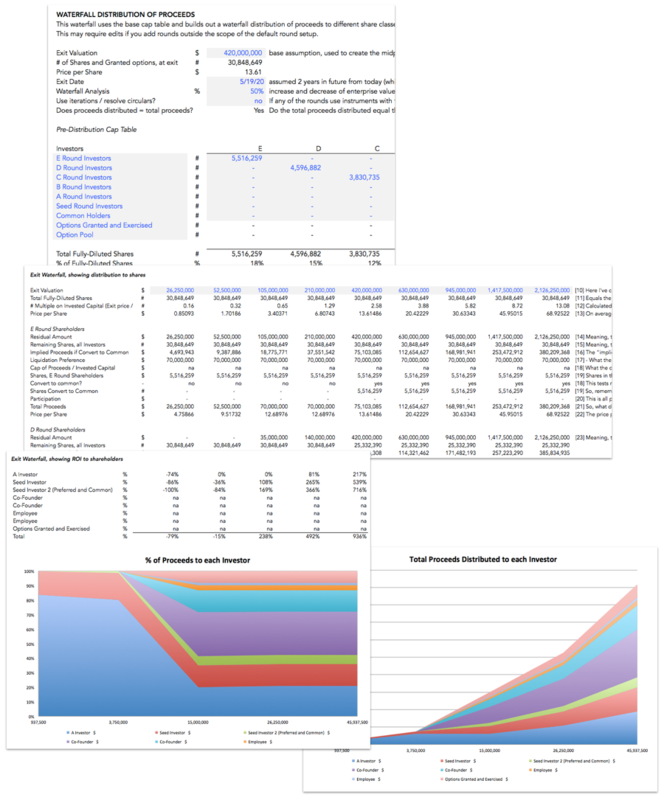 Financial model template to create a capitalization table through multiple rounds of investments, and forecast how investment rounds impact ownership, dilution, valuations, and distribution of proceeds to entrepreneurs and investors through a detailed exit waterfall. Includes a core capitalization table, exit waterfall, and cap table summary that can be used by a company to model their cap table over time. Contains a series of instructional sheets explaining how to issue equity, how to create an option pool, how to issue and convert a convertible instrument, how to create an exit waterfall, and how to value a company through multiple rounds of investment, helping teach how cap tables work so you can build your own specific to your situation if needed. Used by investors, founders, executives — CEO, CFO, COO, VP of Finance — or advisors, mentors, or consultants to build a cap table of exit waterfall for an idea-stage, pre-seed, seed, A, or B stage company. Cap Table: Reorganized the assumptions layout to bring them in line with the Cap Table, deleting the Assumptions sheet and bringing them into the Cap Table sheet. Why? I think in practice it is better - in this case - to bring the assumptions closer to the cap table. The cap table always involved a bit of manual inputs around the investments per investor, and previously it took a bit of back and forth between the sheets to adjust the inputs.This also makes it the same, structurally, as the instructional sheets, which I always like using as my base when I build custom cap tables. Reorganizing the inputs makes it a little less “plug and play”, but I don’t think cap tables are ever plug and play, so removing the sheen makes this a bit more usable, in my opinion. Exit Waterfall: both Exit Waterfall sheets were edited to remove the circular references introduced in v2.2. No changes to the calcs, just changed the structure so that everyone doesn’t have to see the circular references until they are actually needed based on the inputs and options used. Instructional Sheets: Little edits throughout, more notes. Added “Fully Diluted” to all the Convertible instructional sheets to match the main cap table, and because it’s important to show fully-diluted. Added a sheet to show the combination of an option pool and convertible issuance (and conversion). Cap Table: Just a note: Previously, this tool was the same cap table used in the Standard Model. However, going forward, the Standard Model will use a simplified structure for its cap table. The reason is that I don’t always advocate for including a detailed cap table in the Standard Model, and it created an additional layer of compleity that was not always necessary in a forecast model. The simplified structure in the Standard Model can be used with this more detailed Cap Table model if desired, contact hello@foresight.is with any questions. 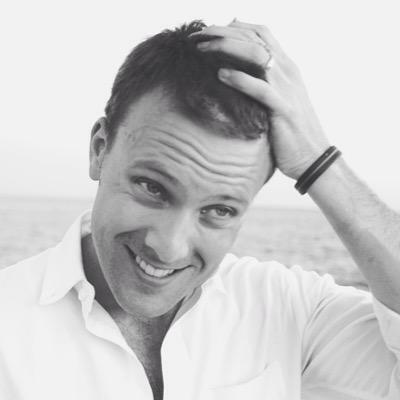 I build standards-based, rock solid financial models to solve real business problems. Here’s what’s inside the Cap Table & Exit Waterfall Tool. The model contains an integrated cap table and exit waterfall that allows you to map out a number of fundraising rounds - from friends and family to F rounds and beyond, using whatever terms you are using for your rounds - using equity, convertible notes, SAFEs, and crypto issuances, and keeps track of ownership, dilution, and value throughout all rounds. Handles the creation of option pools (either created in the premoney or the postmoney) and the conversion of convertible instruments to equity, using either the premoney, postmoney, or percentage ownership method. Summary cap table provides a quick view of the major shareholders, simply select which round you want to show (and optionally, if you want to compare two rounds) and the summary automatically adjusts. This cap table is slightly different than the cap table integrated into the Standard Financial Model, as it provides more options and detail behind how cap tables work, and is easier to edit and understand. As a note, maintaining a clean, accurate cap table for an operating company is difficult, and especially difficult in Excel. But when you want to understand how a capitalization table works and forecast how rounds of financing impact ownership, valuation, dilution, and exit proceeds, a spreadsheet can be great. Once you’re running a company, I highly suggest checking out an online cap table management platform, including Carta, Captable, Visible, Capshare and others. The exit waterfall takes the cap table and evaluates the distribution of proceeds to different classes of shareholders based on different liquidation preference structures, conversion scenarios, and the seniority of different share classes. Visualizes the distribution of proceeds across a range of exit values, so that you can clearly see the impact of structures and the distribution to shareholders over multiple exit scenarios. Assign each preferred equity share class as nonparticipating, full participating, or participating with a cap, and the model automatically adjusts the distribution of proceeds accordingly. Summarizes the distribution of proceed with two charts to clearly show the % distribution and the total distribution of proceeds. Extra instructional sheets to show you the mechanics behind issuing a new equity round. Extensively noted to provide context and instructions to help teach you how to create your own cap table from scratch. Extra instructional sheets to show how different methods of converting convertibles work, showing how the choice of conversion method impacts premoney valuation, postmoney valuation, share price, and share ownership. Demonstrates how discount rate, valuation caps, and interest rates impact conversions. Provided examples of premoney conversion method, postmoney conversion method, and percentage ownership method, extensively noted to provide context and instructions to help teach you how to build conversions into your own cap table. Extra instructional sheets to show how creating an option pool impacts valuation, share price, dilution, and ownership. Demonstrates how to create an option pool in the premoney and postmoney, and highlights how the method used impacts dilution of shareholders in funding rounds, an important part of understanding how option pools impact effective valuations. Extensively noted with context and explanations for each line so that you can build in an option pool into your own cap table if needed. Extra sheet for both investors and entrepreneurs to help value a company, using an expectation of future funding needs, exit potential, and valuations. Creates an analysis of proceeds, IRRs, and gross multiples given a range of investment and follow-on strategies. Combines your forecast of the rates of companies raising additional rounds, failing, and exiting, with your forecast of exit multiples at each investment stage, to create probability-adjusted proceeds, IRRs, and gross multiples for an investment. 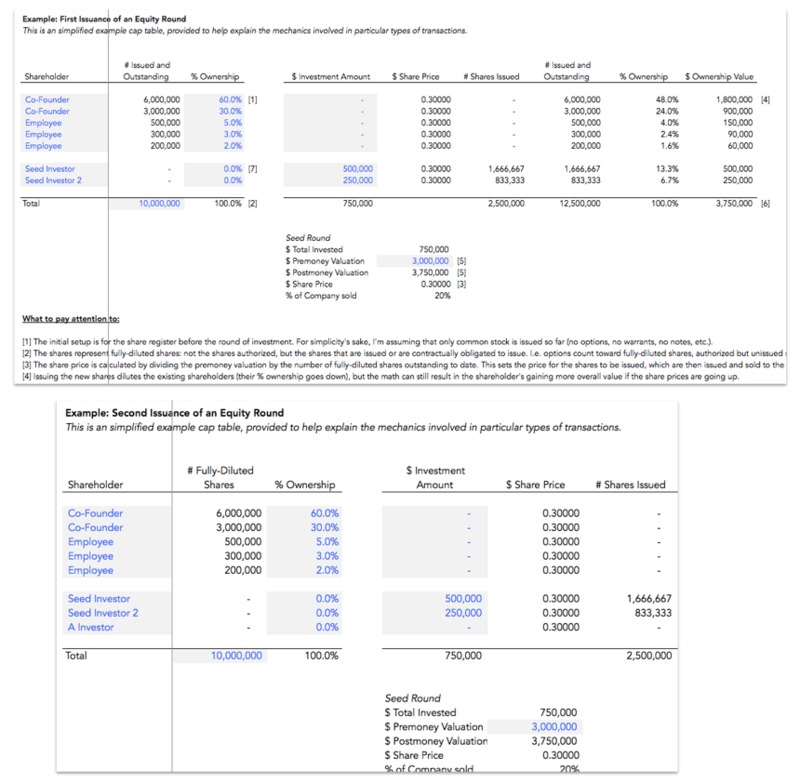 This sheet is a standalone sheet inside the tool, and thus can be used independently to evaluate a company’s valuation and expectation of proceeds to investors. Get help. Chat now or call 1-646-770-0052.